Visiting Antarctica & South Georgia on an expedition ship is best described as a mind-blowing, awe-inspiring and breathtaking experience. 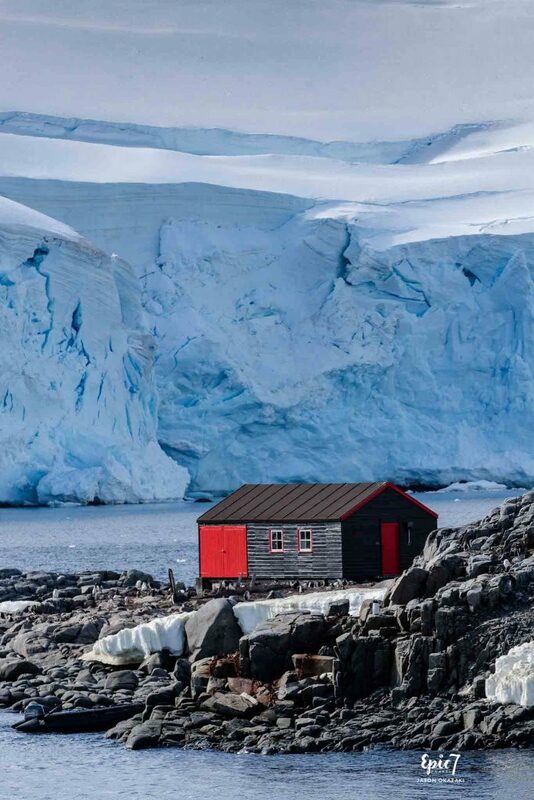 Pristine Antarctic icescapes and curious animals will enrapture you. 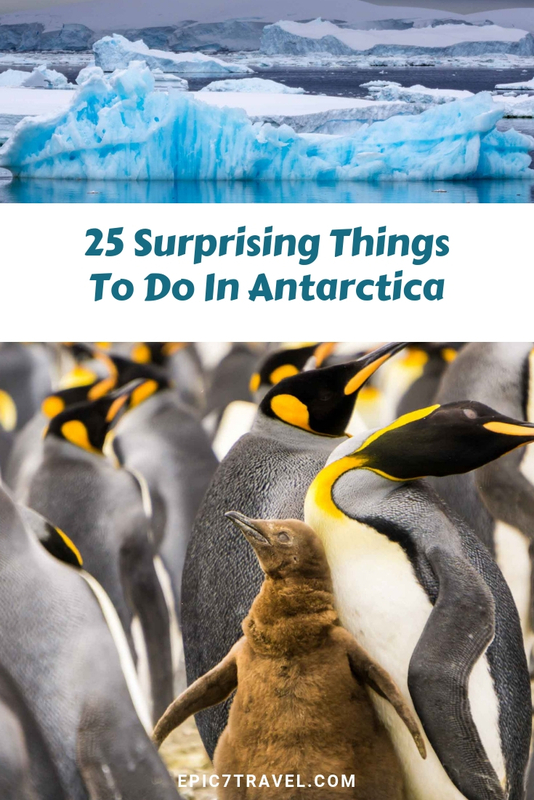 When researching this bucket list trip, your excitement will mount as you imagine these 25 surprising and unforgettable things to do in Antarctica. As you are preparing for your trip, be sure to use my best Antarctica photography tips compiled from two expeditions to help you plan your gear and approach. While you will travel to Antarctica knowing that it will be unique and the bucket list trip of a lifetime, it will capture your soul in a way you never expected. Although the colors, sounds and sights are describable, it’s hard to encapsulate just how striking the beauty and wildlife are. Without ringing cell phones and outside distractions, you will truly immerse in the untouched and expansive beauty on the White Continent. Antarctica’s spell took hold in such a way that it inspired me to resign from my medical device marketing career and chase a dream related to travel photography and writing. While it’s normal to be nervous about encountering huge 30-40 feet (10-13 meter) waves in the Drake Passage (known as “Drake’s Shake”), you might get lucky with good weather and small waves. Despite expecting an unpleasant and nausea inducing ride south (the route from Ushuaia to Antarctica), I’ve been VERY lucky, encountering calm, flat conditions the crew calls “Drake’s Lake” with four crossings on two separate Antarctic expeditions. TIP: If you are prone to seasickness, I highly recommend the Relief Band to manage your seasickness symptoms. I’ve suffered from motion sickness for years and this solution has been game-changing for me. Read more about the 5 proven motion sickness remedies I use here. If you are spending a day or two before or after your Antarctica cruise in the southernmost city in the world, be sure to check out my tips for maximizing your time in Ushuaia, Argentina. 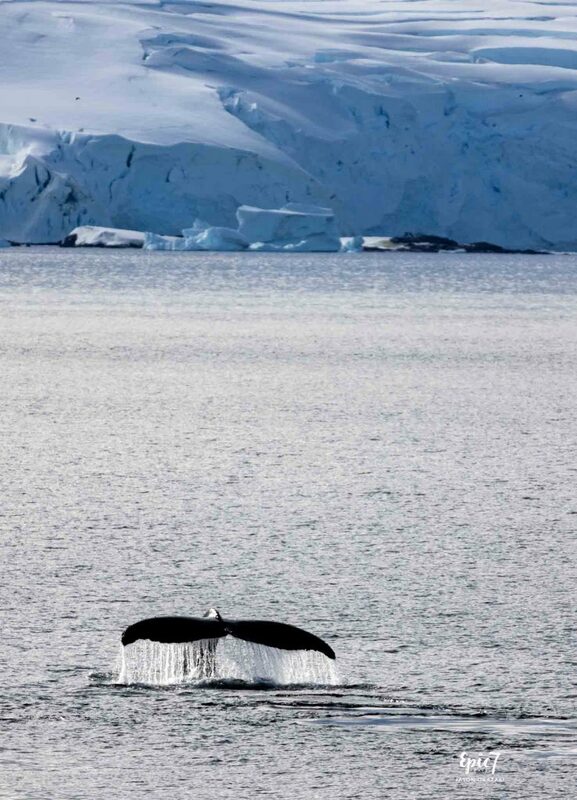 If you are dreaming of seeing whales in the wild, plan your trip for later in the Antarctic season. During our first journey south to Antarctica, calm seas allowed our captain to scan the horizon for potential whales and deftly maneuver the ship. During our very first day in the Drake Passage, he positioned us perfectly to watch four orca whales in their element. A phenomenal way to start the trip! 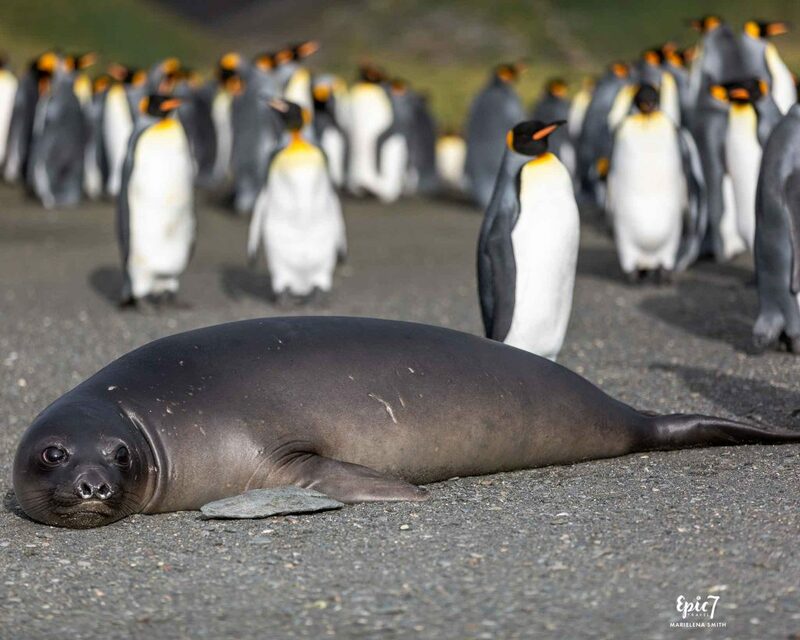 TIP: Visiting Antarctica in February/March, increases your odds of seeing these majestic animals. Orcas live in a matriarchal society, passing along their knowledge within their pods. Both male and female orcas stay with their mothers throughout their lives. Males have a tall, straight dorsal fin. Females have a shorter, curved fin. On average, orcas lives 30-50 years. Not all orcas “wave wash” to knock seals and penguins off of ice. Only certain pods have learned this behavior and pass it down to other orcas. After witnessing the interactions and teaching amongst the wild pod, I realized how happy I am that Sea World will phase out all killer whale shows by the end of 2019. I can’t imagine living a solitary life in an aquarium – it would be like a person living his entire life in prison without committing a crime. While we didn’t see them wave wash, we did see them play “cat and mouse” with penguins. Despite me silently willing the penguins to “swim fast or “move left,” the orcas would grab the penguins and throw them through the air. Swimming feverishly, the penguins were subjected to being tossed repeatedly as other orcas were waiting to practice this behavior. While hard for me to watch, it is also fascinating to see the knowledge transfer as the younger juveniles in the pod imitated the adults. We were fortunate to see Humpback, Southern Right, Orca and Bowhead whales. We even saw a Southern Right whale breaching! Sadly, this is an incredibly rare and lucky sighting as commercial whaling decimated their numbers. 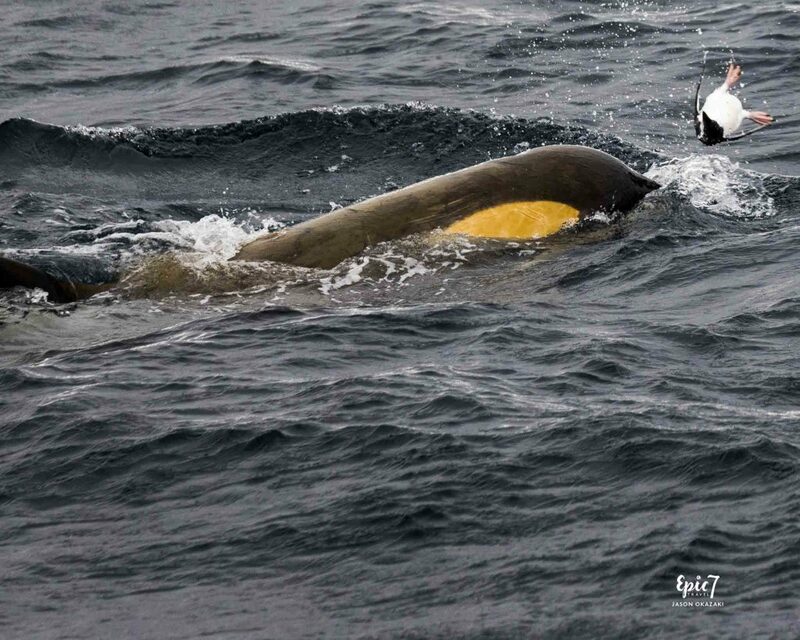 After 138 visits, our expedition leader had only seen three Southern Right whales. Shockingly, two million whales were killed in Antarctica for oil, meat and soap in the 20th century. Fortunately, the abundant krill populations attract the various whale populations to feed during the Antarctic summer. After which, they travel north to breed and birth calves. Are you interested in swimming with humpback whales? If so, get inspired to plan your own heart melting encounters with moms and calves in Tonga from July – October each year. Our stories, photography, and videography will allow you to escape and experience this intimate wildlife experience. Female humpbacks travel 3700 miles/ 6000 km from Antarctica to Tonga to birth their calves in the calm, sheltered warm waters. Since the experience is so magical, I returned two seasons in a row to swim with them! Landing in South Georgia and being greeted by adorable, wide-eyed fur seals is unexpected and delightful. Watching them scoot down the beach and into the water as your zodiac approaches is hilarious. Interestingly, many of the fur seal pups will do a back-bend, checking you out from an upside down perspective, which is incredibly endearing. The fur seals are just the beginning. When you are bending over taking pictures, curious penguins will often waddle over and pull on your backpack straps, pant legs or shoelaces. My husband experienced this firsthand when he sat down in the snow to photograph. Once you get to eye level with a penguin, their fears melt away and they become inquisitive examiners. Let your imagination run wild before your Antarctica trip, envision sailing past massive icebergs and shielding your eyes from the sun reflecting off untouched, bright, white snow. Landing in Salisbury Plain, South Georgia (a sub-Antarctic island), and encountering greenery is unexpected, which provides a stunning backdrop for photos. The greens and yellows accentuate the already photogenic King penguins and their beautiful color gradations. 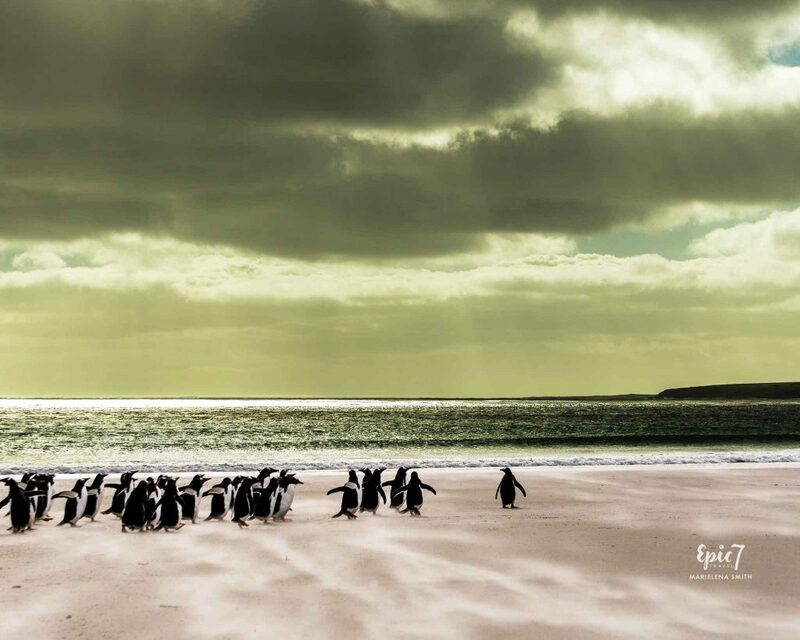 And, while you expect white sand beaches on tropical islands, it’s surprising to encounter in the Falkland Islands. Photographing Gentoo penguins marching along the beach to head out for a morning swim is heartwarming. Wind pushing sand along the beach can provide an ethereal feel for photos. TIP: To capture an image from this perspective, it’s key to lie on your belly in the sand and to be at the penguins’ level. 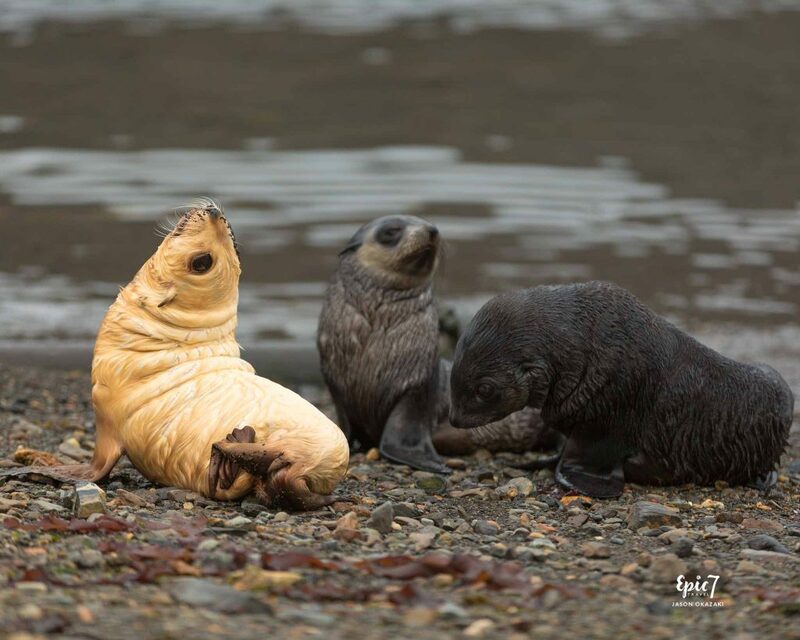 During the trip we saw eight instances of “Blondie” fur seals. 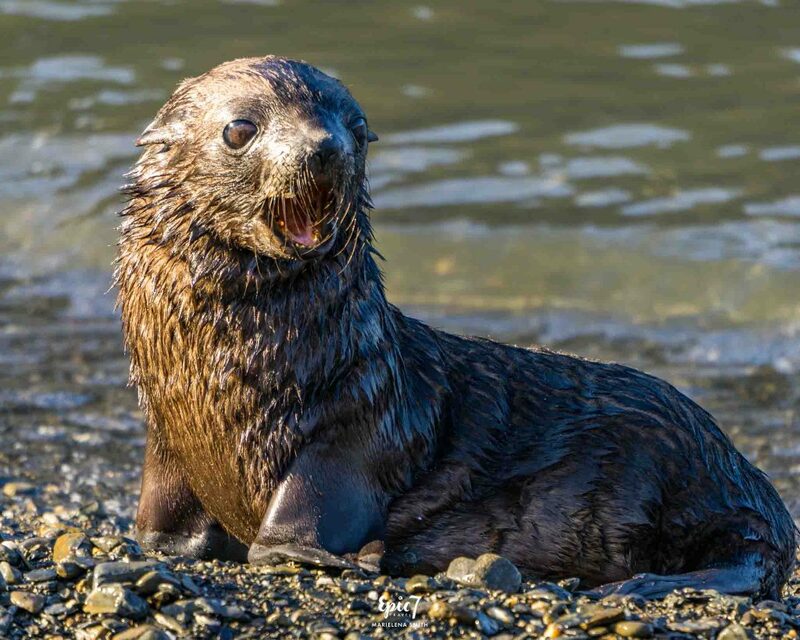 1 in 1000 fur seals will be born as a blondie, with golden fur instead of brown fur. With their light color, they are easy to spot on the beaches. Sadly, from a very young age, they are picked on – often not surviving to adulthood. Observing a small blondie being harassed and chased by others while I sat on a beach broke my heart. I just wished they would leave her alone. It’s sad to think that even animals fear what’s different than them. 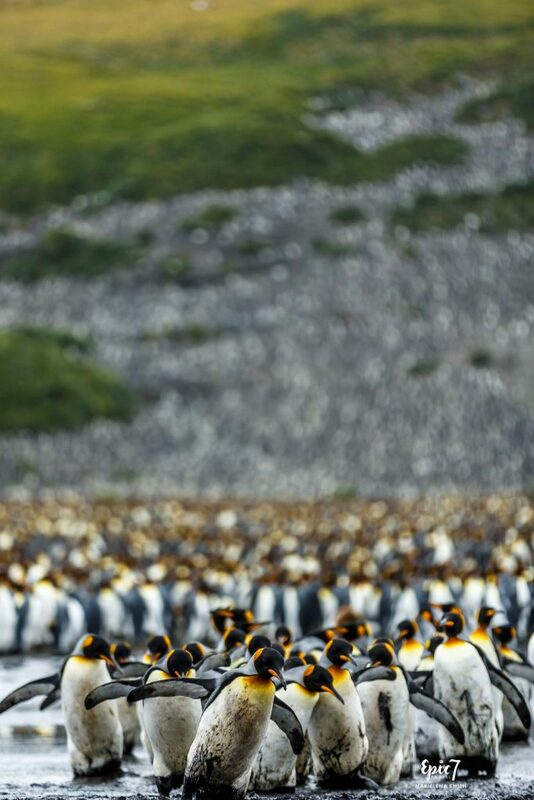 While South Georgia is known for having large concentrations of King penguins, seeing and hearing 250,000 congregated on one beach is spectacular and jaw-dropping. Wrapping your head around the sight before your eyes takes a little while as your brain processes that penguins extend as far as the eye can see! Be prepared for not only the overwhelming sight and sound, but also the smell that will assault your senses. You will likely smell them from the boat! TIP: To counteract the powerful smell of penguin guano, wipe Vicks Vapo Rub under your nose. This trick works like a charm during smelly plane and train rides around the world too. 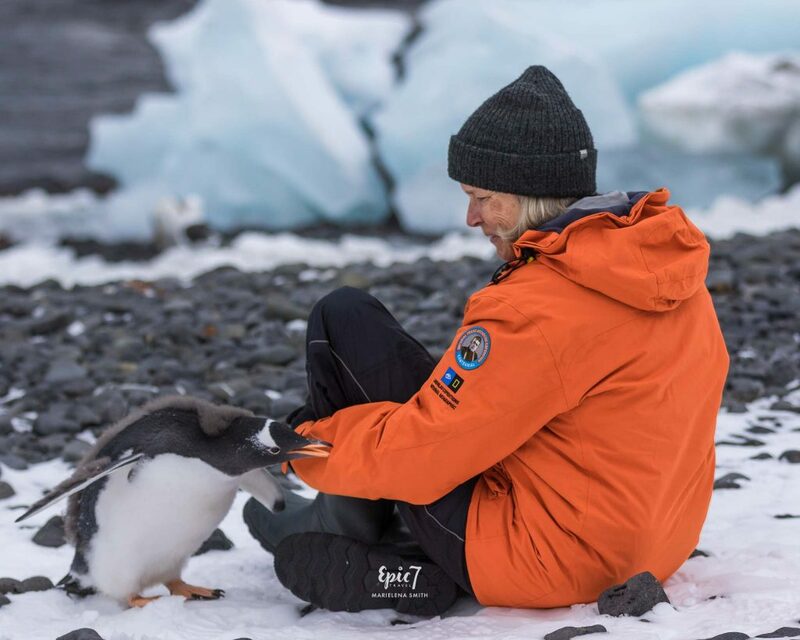 For most, seeing a baby penguin tops the wish list for Antarctica travel. Since we visited late in the season (from mid-February to early March), we were prepared for penguin chicks to be scarce. However, we still hoped to glimpse one baby penguin still on its parents’ feet. 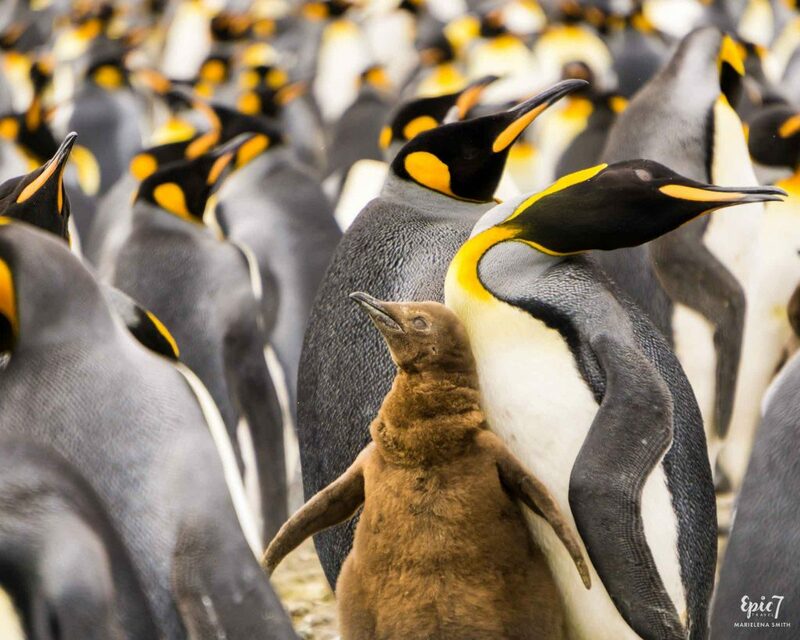 Luckily, a friend spotted a three-week old King Penguin chick with its parents. Watching the mom and baby interact for at least 30 minutes, we deemed our trip wish list complete. TIP: To maximize the number of penguin chicks, visit from late December to January. Already thinking we were the luckiest people in the world, a couple came by and said, “Oh, if you like this, you should go around the corner as there are 100 babies.” I figured they were exaggerating, but sure enough, there were hundreds of king penguin chicks!! I died and went to photography heaven, proceeding to take 1000+ pictures in an hour. I might have a slight obsession with baby penguins…. Before visiting Antarctica, I had neither seen nor heard of a Commerson’s Dolphin. They are gorgeous and incredibly unique! Standing on the beach, thinking that our eyes were playing tricks on us, we glimpsed these lovely creatures surfing the breaking waves. 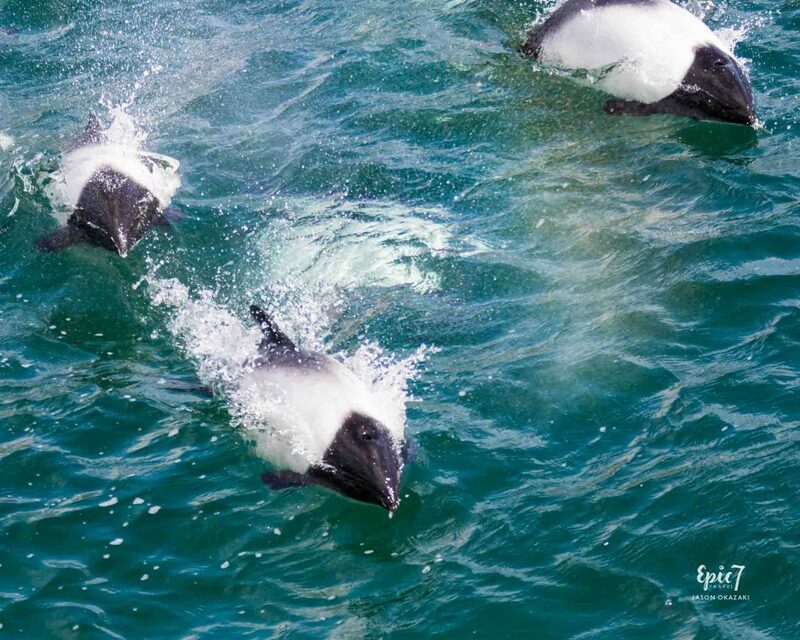 Once they noticed the zodiacs in the water, the dolphins shifted their play to the zodiac wake, escorting all of the lucky passengers back to the main ship. Visiting Grytviken in South Georgia is haunting. Operating from 1904 to 1964, this whaling station played a major role in the whale industry that sadly slaughtered two million whales in Antarctica’s Southern Ocean. Wandering the grounds, it’s heartbreaking to think about how many whales were killed. While it’s still rare to see whales in the waters surrounding South Georgia, fur seals and penguins are abundant. 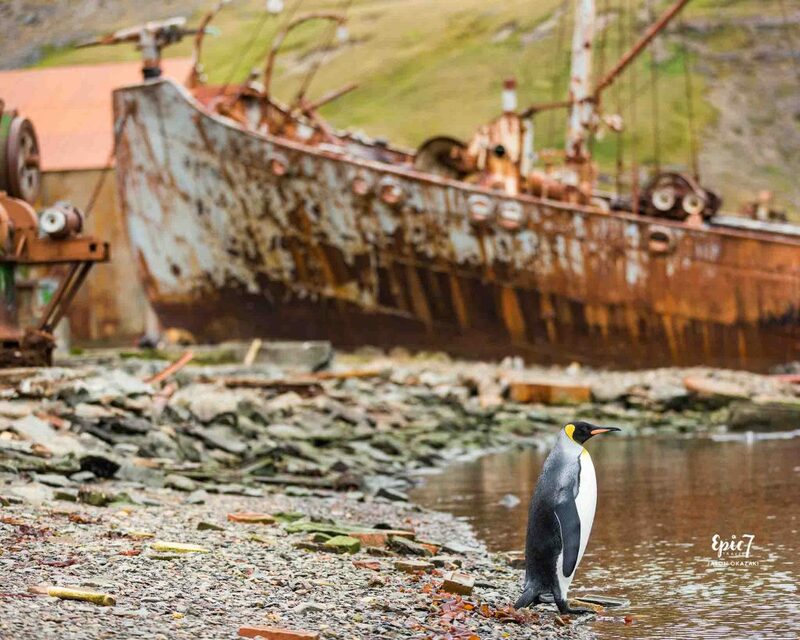 Although the rusty whaling ships, tanks and equipment are a sober reminder of the site’s heartbreaking past, they provide a fascinating backdrop for your images. TIP: If you are wondering how you can travel to Antarctica for work and are interested in volunteering, the Grytviken gift shop is one place you can apply to work for a season from October to March. Antarctic glaciers and “bergy bits” are a stunning blue, giving off an other-worldly glow. When the light hits them just right, it will take your breath away. This brilliant hue is a result of the incredibly dense ice absorbing all colors in the spectrum except blue. Multi-layered gray skies further enhance this contrast. 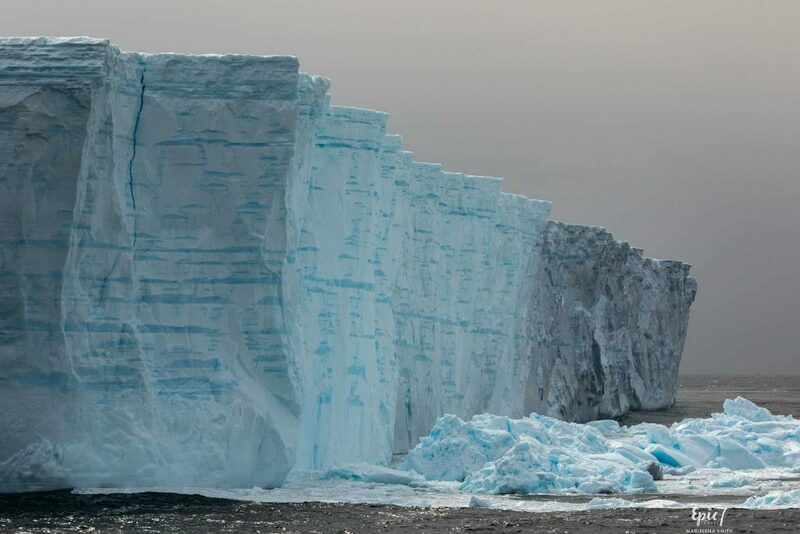 Did you know that when you see an iceberg, you are witnessing only a tiny portion as 90% resides below the surface. Watching crabeater seals play and penguins dive into the sea from this perspective is enrapturing. Given their focus on napping, playing or eating, they typically ignore you. 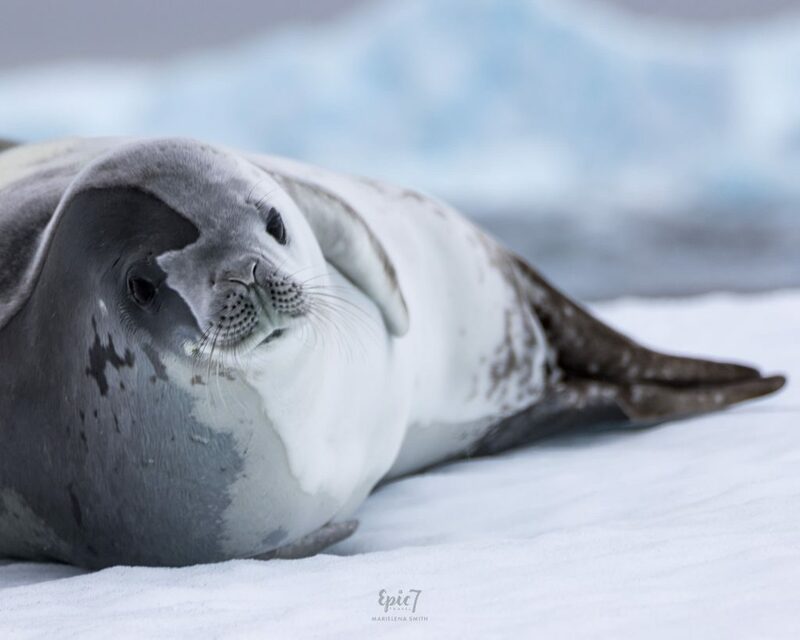 Did you know that seals regulate their temperature in such a way that they don’t melt the ice beneath them? 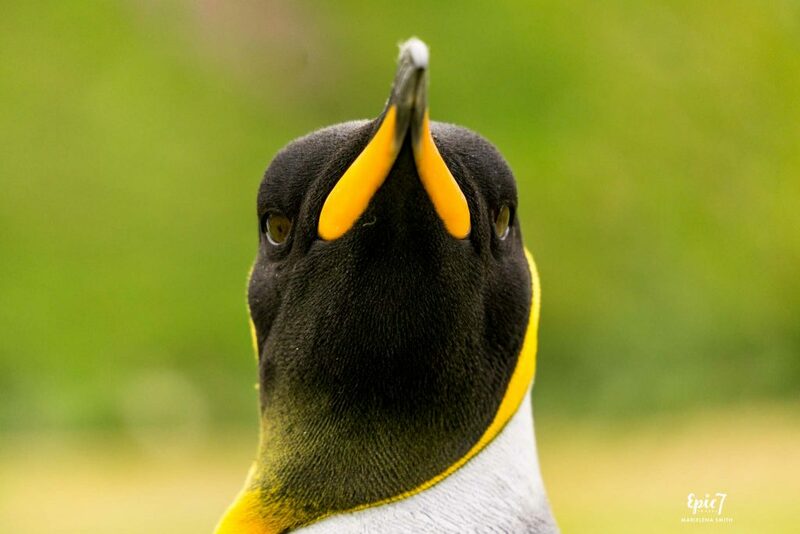 King penguins mature from chicks to the regal adults over a 13-month period. During this transitional time, they are called Oakum boys. 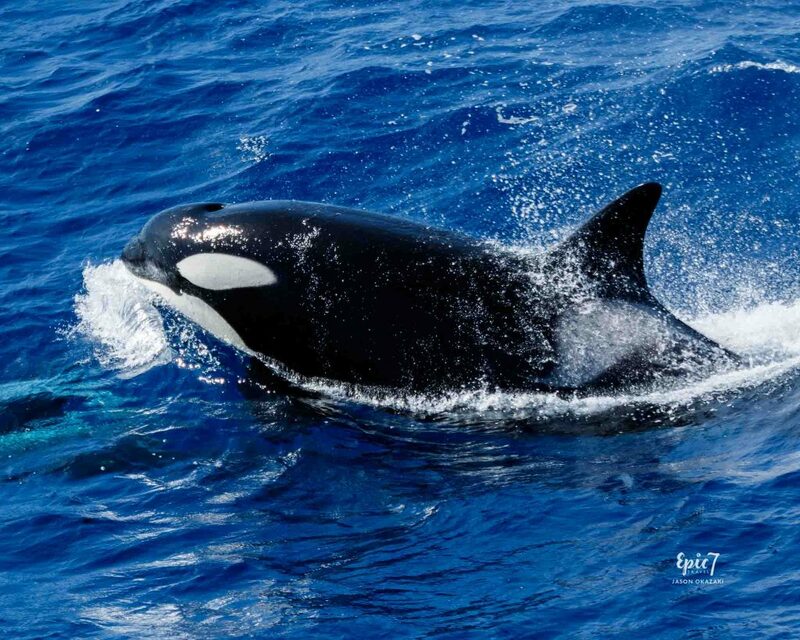 Initially, when sailors encountered these juveniles, they thought they were a different species. While King penguins are cute as chicks and spectacular as adults, their awkward teenager years are not too attractive. One in particular caught my attention. In the midst of losing his downy feathers and transitioning to an adult, he appeared to be wearing a tutu! Priceless! Prior to this trip, I mistakenly thought King penguin chicks looked the same as Emperor Penguin chicks. 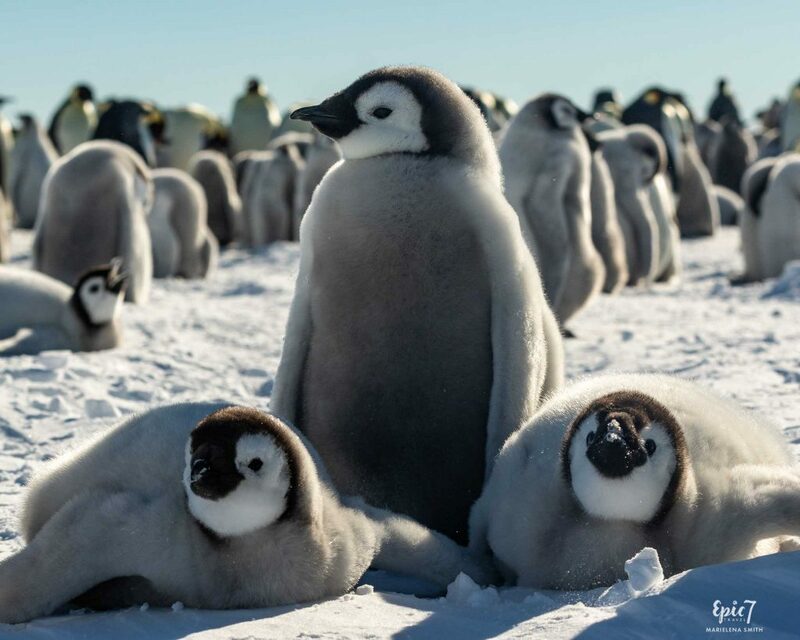 Nope, they definitely are not the same super cute and fluffy, grey and black Emperor penguin chicks we all think of from March of the Penguins and Happy Feet. 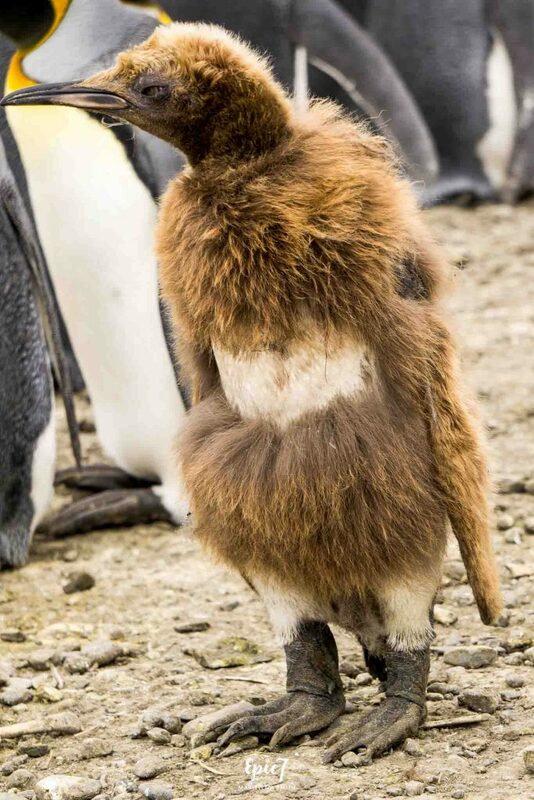 Though, I think this awkward king penguin qualifies as so ugly, he’s cute. 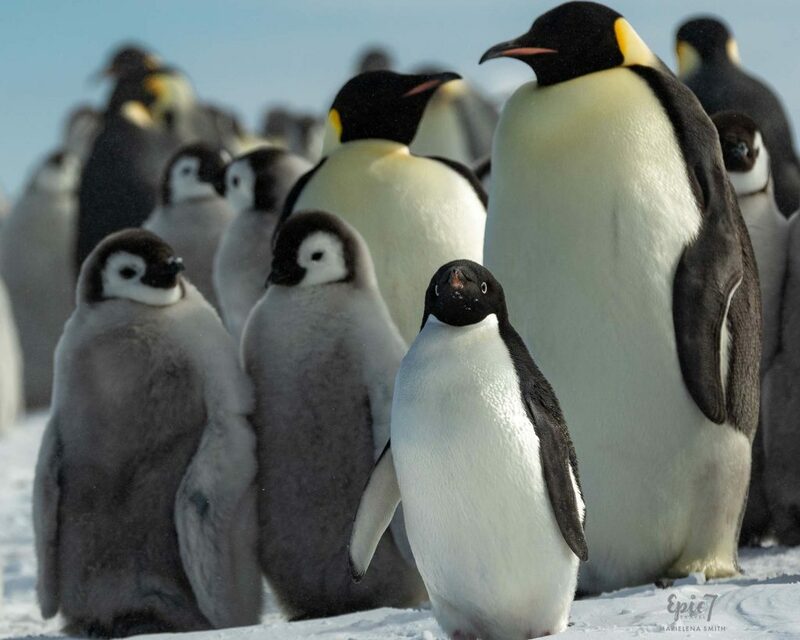 TIP: If you want to see and photograph the Emperor Penguin chicks, you will need to embark on an expedition to the Weddell Sea on an icebreaker to see them as they are located much further south than Antarctic cruise expeditions travel. These expeditions are rare and typically only run in October and November as the parents and chicks depart the colony by mid-December. TIP: If you encounter situations like this with water, position yourself low and look for reflections. Adelie penguin antics are hilarious to witness as they are both feisty and fearless. Watching a lone one infiltrate and instigate the Emperor penguin colony kept us laughing for hours. While he initially seemed innocent and lost, he then decided to chase both the chicks and skuas, providing non-stop entertainment. 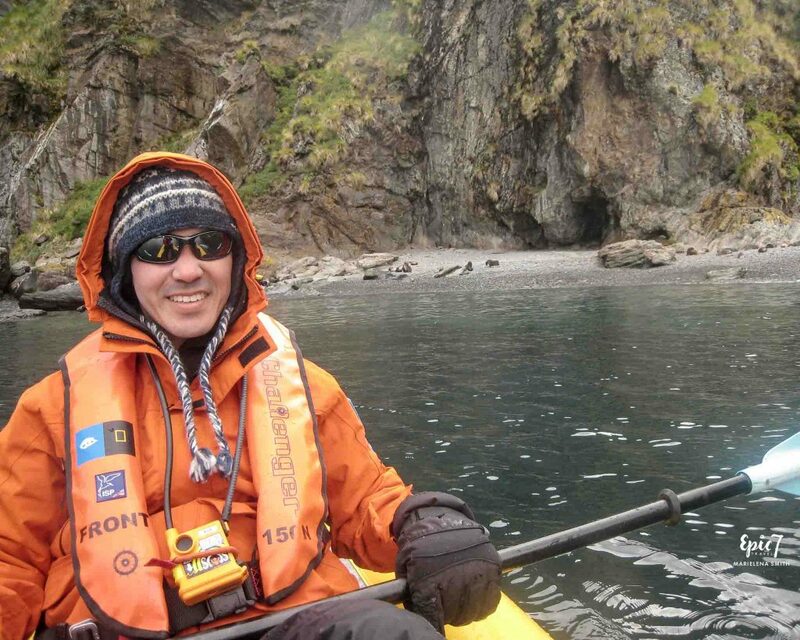 Kayaking is one of the most active and fun things to do in Antarctica. Gliding along icy bits while watching penguins and seals dive into the water around you is exhilarating. You might even get lucky and see whales while kayaking! Although the outside temperature is cold, you’ll keep warm with the exertion. Since the kayaks are very stable, you’ll feel very safe. For additional peace of mind, the cruise expedition leaders will put a beacon on you that will alert them in the unlikely event that you fall in. TIP: Bring a Go Pro or point and shoot camera in a housing to capture imagery from the water level. 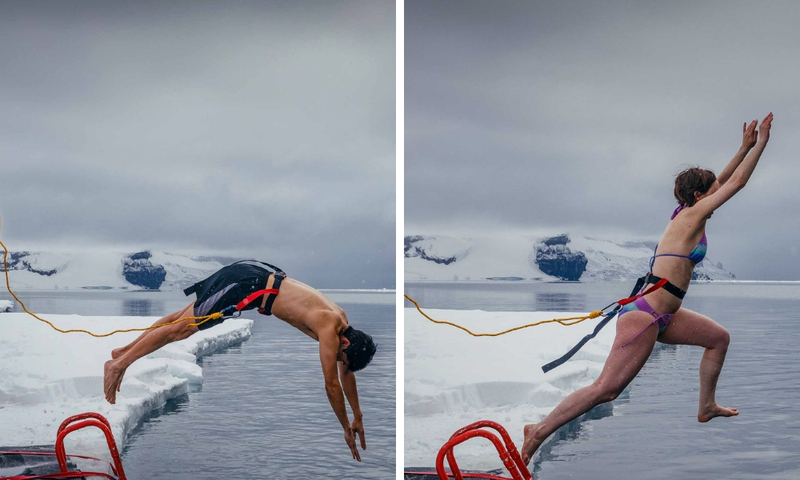 While jumping into ice cold water (31F/0C) without a wetsuit in 22F/-6C temperatures seems crazy, it’s a once in a lifetime opportunity that I highly recommend. Taking a page from the penguins’ book, I vertically launched myself out of the water and back onto the platform immediately after submerging. And, despite getting an “ice cream headache” that lasted for six hours after my first polar plunge, I couldn’t wait to repeat the experience during my second Antarctic expedition when I returned to see the Emperor Penguins two and a half years later. TIP: If you have a Go Pro, bring it with you for your polar plunge. And, if your ship has a sauna, use it to warm up after the polar plunge. Most Antarctica expedition cruises sell postcards and stamps on board so that you can send mail to friends and loved ones back home. No doubt people will be excited to see an Antarctica postage stamp and know that they received a postcard from the most southerly post office in the world! Having the opportunity to meet the people who work at a research base is fun. 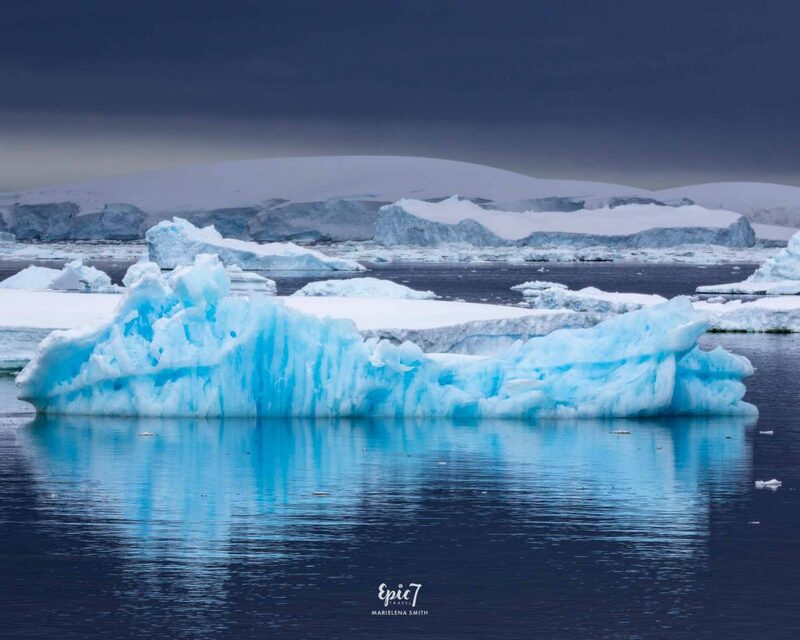 While daylight hours are extensive during the summer season when you will visit, the workers who remain through the winter in Antarctica brave sub-zero temperatures, gale force winds and dark days (the sun doesn’t rise for a few weeks in June). Elephant seal pups are incredibly endearing with their huge eyes. If you visit early in the season in November, you’ll find they are seeking companionship. While they are born weighing 75 pounds/34kg, they quickly balloon to 300 pounds/136 kg within a month. After fattening them up that first month with their nutritious milk, their mothers leave them to fend for themselves. Given that they are still hoping their mums return, they will scoot down the beach, sometimes laying their heads in your lap if you sit quietly. 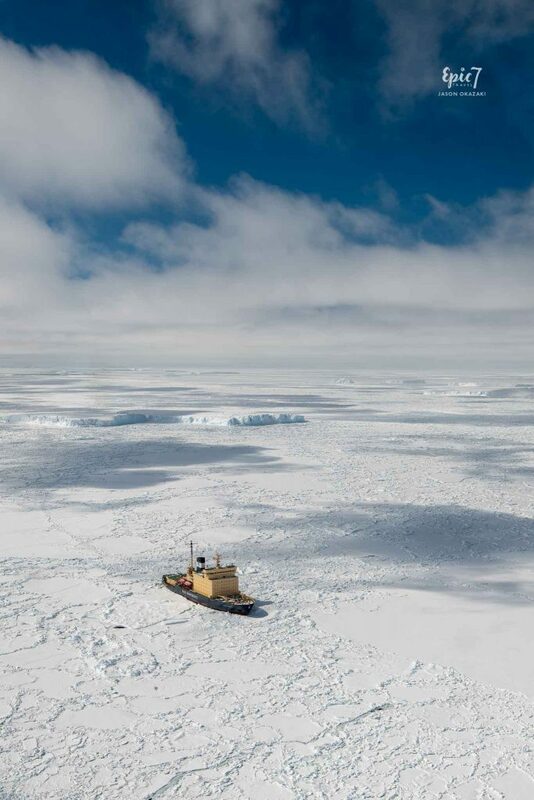 Hearing the thunderous boom as icebergs calve will both startle and amaze you. Massive pieces catapulting into the water can lead to huge waves rolling across the surface. 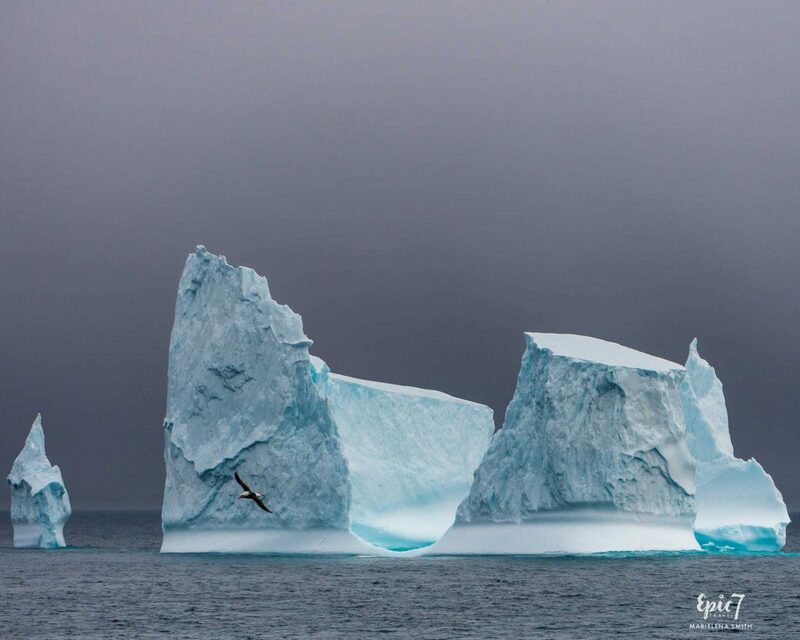 Due to this phenomenon, zodiacs never get very close to icebergs when they are cruising in their vicinity. Fast ice is ice that is attached to a shoreline, but has no solid land beneath. Having the opportunity to walk on this at Seymour Island and another area in Antarctica ranks as a highlight for us. It’s also a great way to capture wide angle perspectives of your ship amongst the ice. Before guests disembark, staff checks for both ice thickness and any potential cracks. Flags or cones are also placed to indicate areas to avoid. Cruising through the Lemaire Channel near sunset is an indelible memory. The serenity and reflections will take your breath away. Given that ice conditions vary significantly in this area, ships can’t always venture inside the channel. The surface ice provides a beautiful foreground element for the surrounding landscapes that will morph beautifully as the light shifts. TIP: If your cruise ship can venture in, make sure to position yourself at the bow and do a time lapse if you can. While helicopters aboard expedition ships are rare, I highly recommend you take advantage of this option if it is offered. 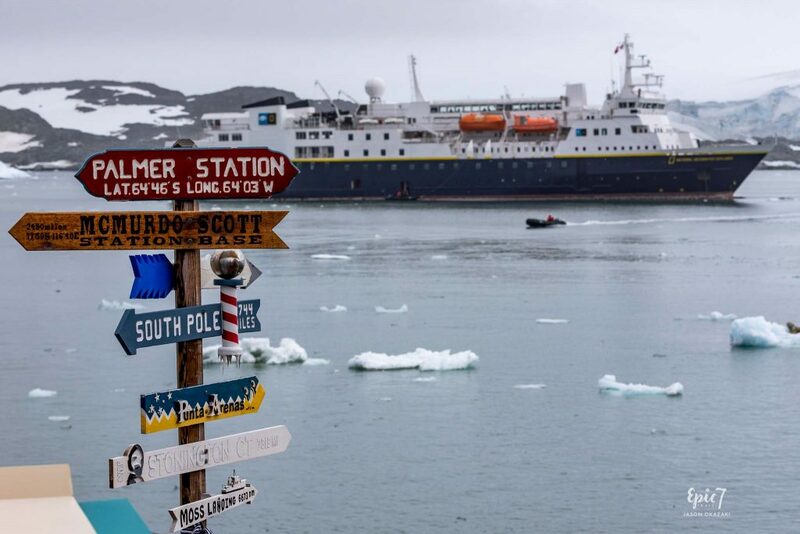 When we were aboard the Kapitan Khlebnikov Russian icebreaker with Quark expeditions, we transferred ashore via helicopter as zodiac transfers are not an option. 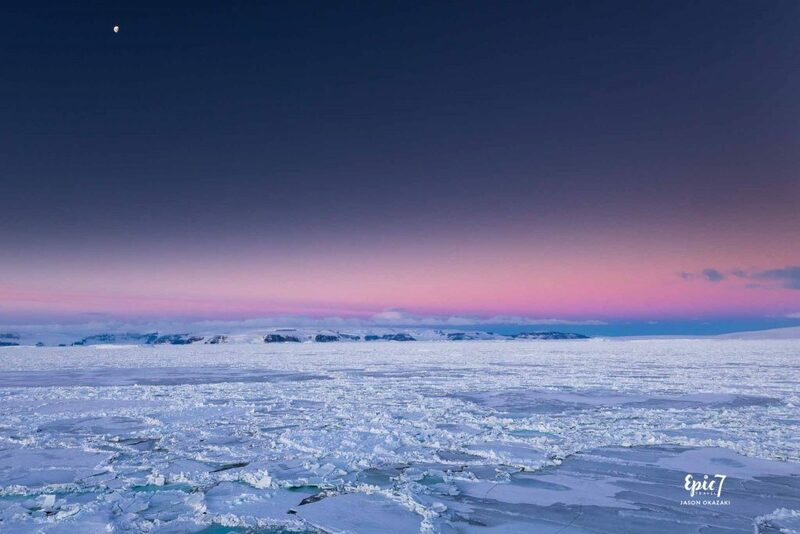 Seeing Antarctica from above allows you to view its vastness and beauty from different perspective and truly appreciate its White Continent moniker. TIP: Include penguins, another helicopter, or your ship to provide a sense of scale for the icebergs you are flying above. 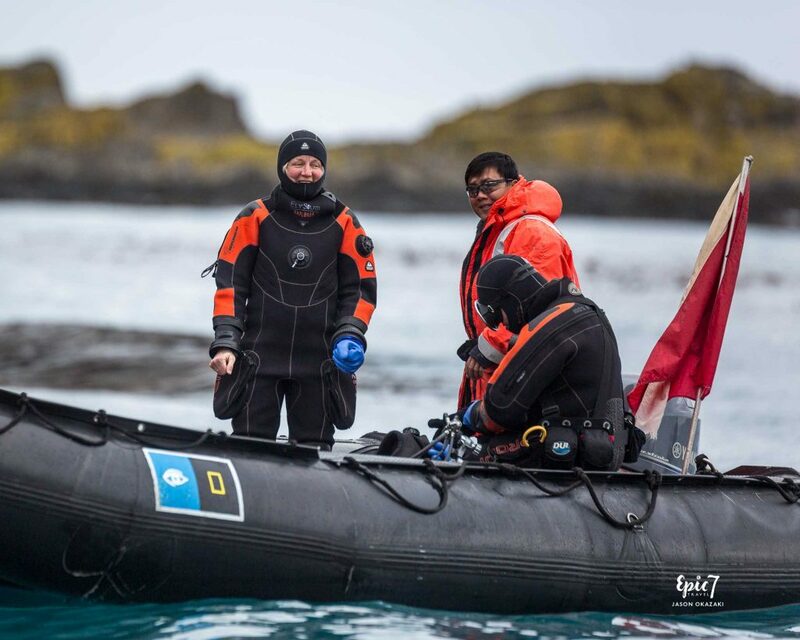 While we didn’t get to indulge in scuba diving on either trip, we are amazed by the over/under pictures we’ve seen of icebergs, penguins diving in their element and playful sea lions checking out the divers. 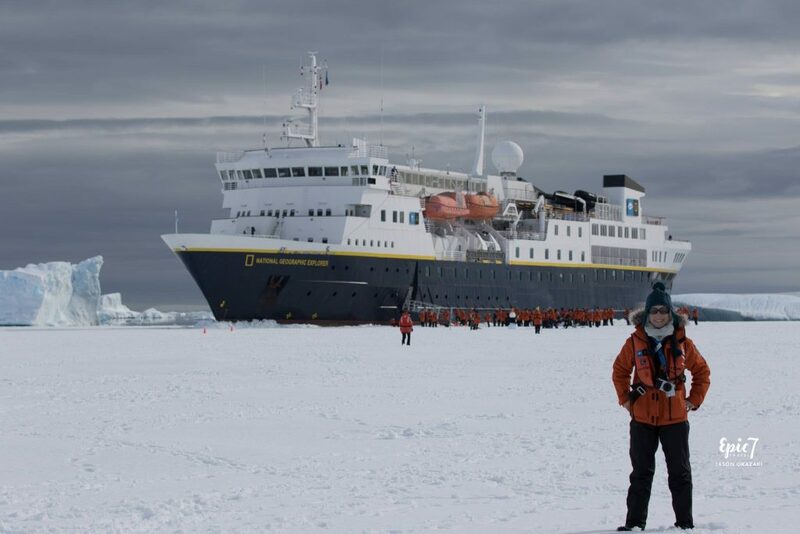 When we were aboard Lindblad Expeditions, we had David Doubilet and Jennifer Hayes, two supremely talented National Geographic photographers, aboard. Having the opportunity to see the world beneath the ice would be mesmerizing. TIP: To do this requires dry suit certification and using special regulators that won’t freeze in cold temperatures. If you visit in October/November or February/March, take advantage of the gorgeous landscapes to photograph a stunning sunset in this beautiful part of the world. since the sun sets so late, you will likely have to wait till 10 or 11pm for the light you desire. If you are visiting during high season, you can’t capture sunset as the sun never really sets. You make Antarctica sound just like how I dream it to be! ❤ Here’s to more adventures in our lives. Cheers! Thanks so much Pooja! So glad to hear you enjoyed the Antarctica post. Wishing you the best of luck with visiting and finding a role there to experience Antarctica’s awe-inspiring beauty, landscapes and wildlife. You will love it! 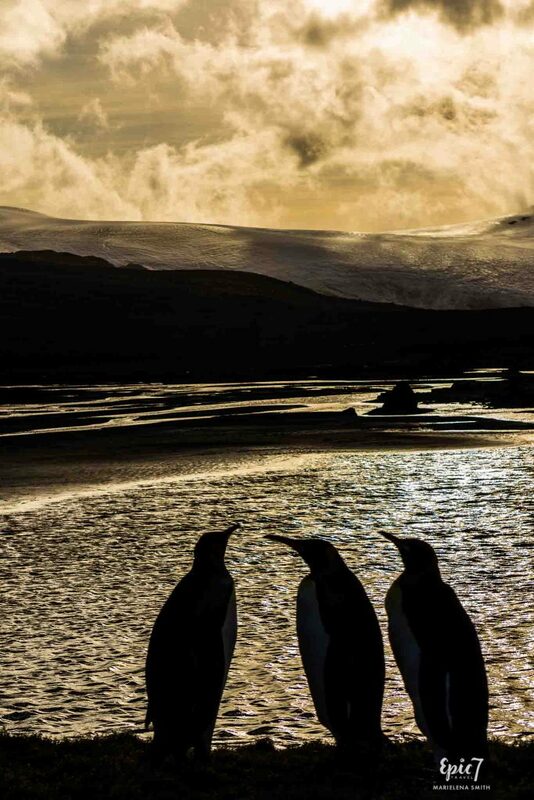 Thank you for sharing your amazing images and descriptions of your travels in Antarctica! It is definitely on my list of places in the world that I want to experience! Everyone I know who has gone there, including my (at the time 85 year old) mum said it was life changing and they wanted to return. Alden, I’m delighted to hear you enjoyed the Antarctica article. It’s definitely a worthy once in a life time, bucket list experience. It was the most unforgettable and memorable trip we had on so many fronts. Wow, that’s amazing that your mum went at 85! Hats off to her! I definitely hope to still be exploring far-flung places as she did when I’m 85. Amazing photos! Reading your blog is like a geography and zoology lesson rolled into one! I also appreciate the spectrum on wildlife – from fun facts to the serious environmental factors impacting wildlife. Your photos and personal experience inspire me to add more adventure travel destinations to my list. 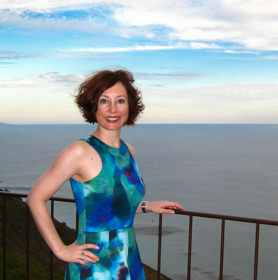 Thank you for sharing your ongoing journey to fascinating destinations across all 7 continents. Thanks a lot, Allie. I’m ecstatic to learn you love the multi-faceted blog posts. For me, the best part of these trips is being able to share the facts we learn more broadly. Mother Nature’s gifts are fascinating. Photography has provided me with a rewarding medium to both appreciate the scenes and observe them in new ways. Love your blogs and photographs. You inspire me to travel and see the world. And when I can’t, I can live these adventures through you. Thanks so much, Beth. I’m so glad you are enjoying the stories and images. The best part is being able to share and inspire others! 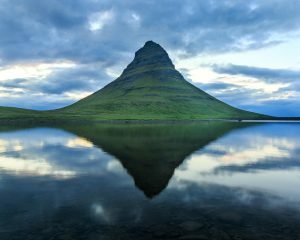 Your photography and anecdotes bravely get up close and personal with nature, landscapes, and reflection. Through words and images you make the unknown enticing; the exotic accessible. Your creativity and knowledge is a gift worth sharing for all who marvel at this incredible planet we get to live on. Thanks so much for your kind words, Susu. I’m so happy to hear about the impact of the imagery and accompanying stories for you. Our planet has so many gifts to share. My hope is I can play a small role in inspiring people to see and conserve these amazing places so people can experience them for generations to come. Amazing photos. I learned so much about penguins! Now I need to add a trip far south to bucket list!! I’m so happy to hear you enjoyed it, Mark. I had no idea there were so many different types of penguins until we visited Antarctica. They are highly entertaining with their adorable antics. We loved spending hours on the beaches observing and photographing them. Antarctica is bucket list worthy. The most epic location we’ve ever had the privilege of visiting. Great pictures and post !! I plan to go some day in Antarctica , although some think i’m nuts lol. 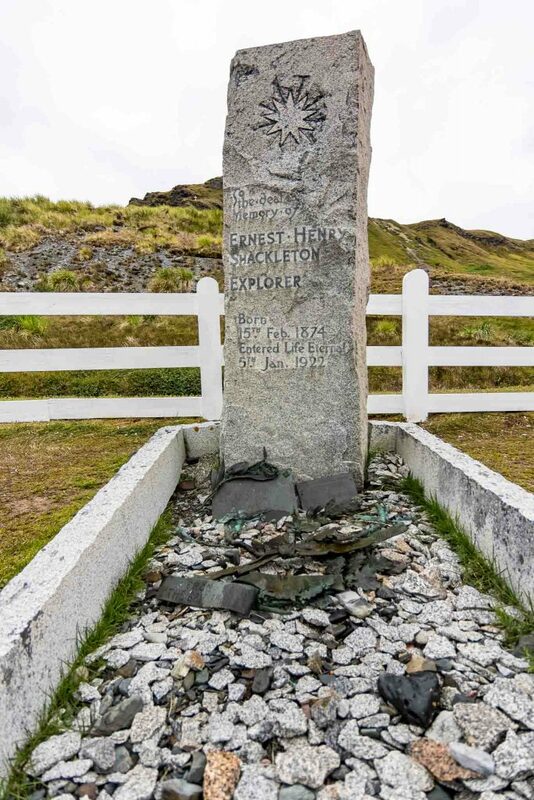 Did you have to pass through the Drake Passage? To be honest that would be the scary part for me. Thanks so much, Sonia. 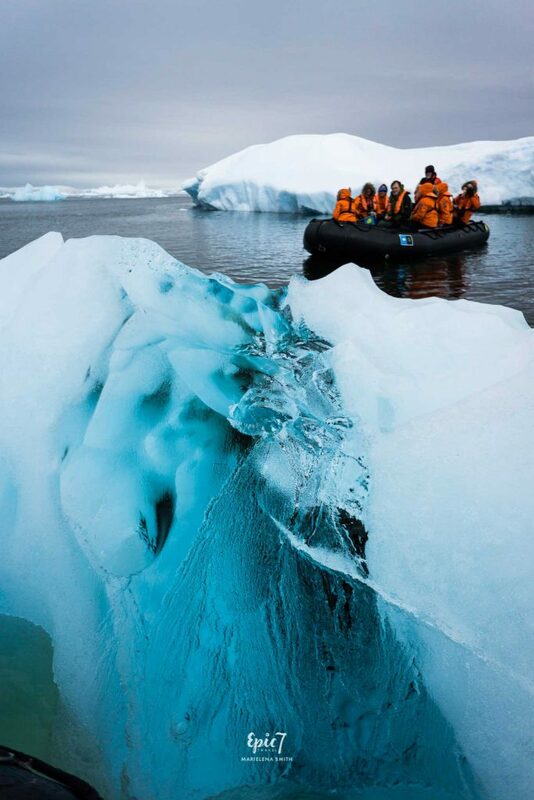 Antarctica is a truly awe-inspiring and unforgettable destination. Definitely worth a visit. Yep, we did cross the Drake’s Passage. I’ll admit I was very nervous about it given that I get severely seasick. However, we got very lucky that it was a super calm “Drake’s Lake” vs a rough “Drake’s Shake” crossing. If you are prone to seasickness, I highly recommend getting a Relief Band before the trip. It works magic for both my husband and me. 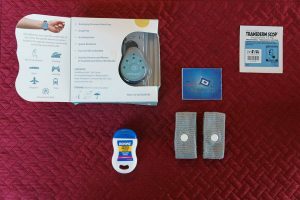 Check out my Seasickness Post in Travel Resources for more information. We encountered 10-15 foot swells returning from the Falkland Islands to Southern Argentina our last night and the Relief Band saved the day! I used to suffer miserably on boat rides and in cars and since discovering the Relief Band, travel has become much more pleasant for me. That’s great news that you don’t get seasick, Sonia. Drake’s Passage can have waves up to 40 feet high during storms. Fortunately, we didn’t encounter those, but I’ve seen some videos with ships crossing in rough conditions. Friends who’ve crossed it in suboptimal conditions indicate that bolted tables and chairs and handrails throughout the ship help. And, they recommend heading to your room when it’s rough. I hope you make it to Antarctica as it’s a very special place. I’m so glad my passion for wildlife comes through in both my writing and photography. It’s incredibly entertaining and intriguing to watch the fearless animals interact with one another and check you out. We had neither seen nor heard of blondie seals prior to our trip. It breaks my heart that they are picked on as a result of their delicate beauty. Well done! What a great and informational blog post. 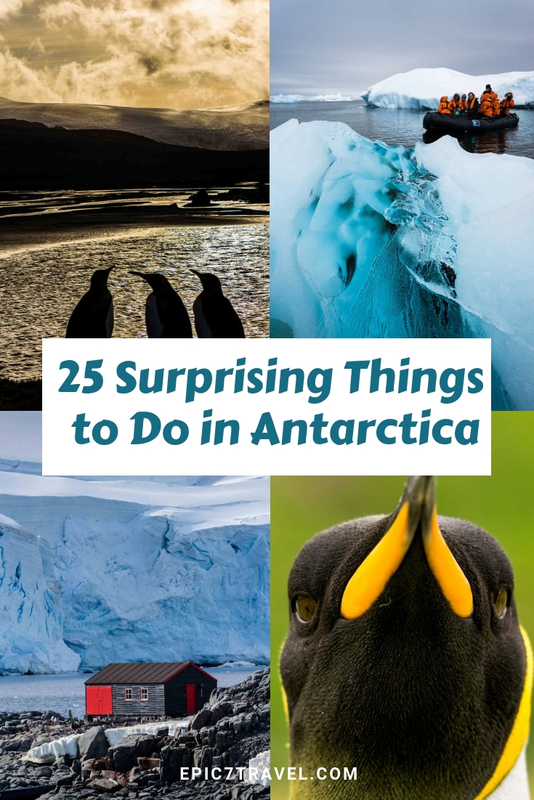 I had no idea how many different animals you could see while visiting Antarctica. The pictures are a fantastic addition to the blog. Keep the blogs coming! Thanks so much Shannon! We were astounded by both the wildlife variety and fearlessness in Antarctica. So glad you enjoyed this quick escape to the White Continent. It’s such a special place to visit. More Antarctica posts coming! 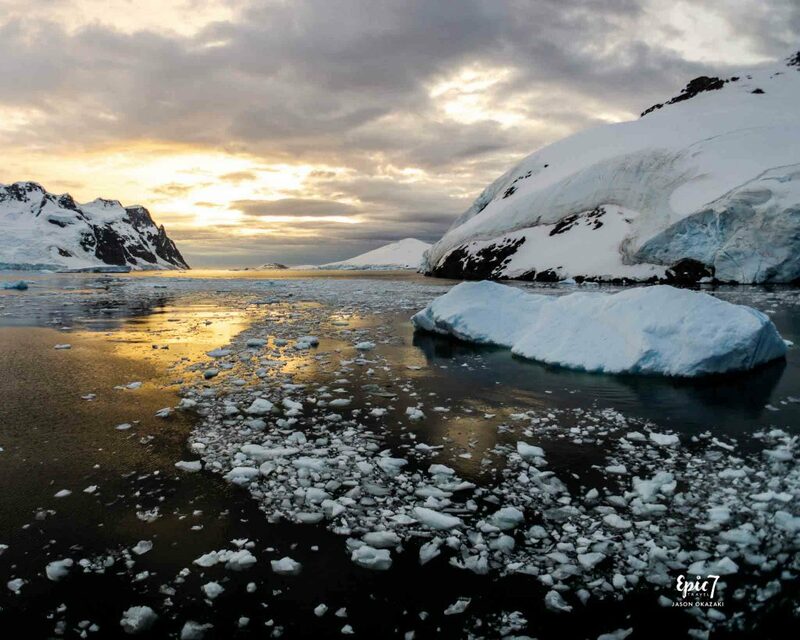 Marielena, your article about your trips to Antarcticais is sooo amazing!! Tanja, I’m delighted that you enjoyed both the article and the imagery. Antarctica is a place that truly touches the soul, providing the impetus for me to chase a dream related to travel photography, writing and conservation. As a wildlife enthusiast, there is no place like it – you will love every moment of your time there. I hope you make it there one day soon. I have more articles about Antarctica coming soon, which I hope you enjoy equally!